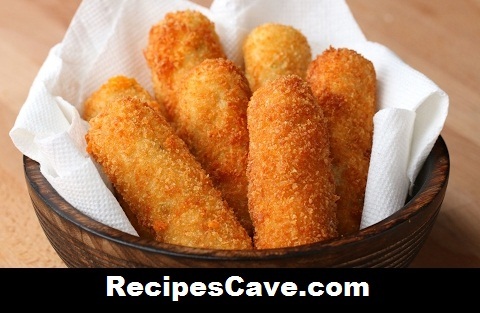 Potato And Cheese Stick Recipe - Here is potato and cheese stick recipe follow the bellow simple steps. 3 russet potatoes, cooked and cubed. In a large bowl, combine cooked potatoes, sour cream, green onions, bacon, salt, and pepper. Cut cheese into ¼-inch strips. Take a spoonful of potatoes and make a ball. Place the cheese strip in the middle and wrap the potato around the cheese until it is evenly covered. Dredge the sticks in flour, egg, and panko. Fry in oil that is heated at 350°F/180°C for 3 minutes or until golden brown. Transfer dredged sticks onto baking sheet. Drizzle olive oil and salt and then bake for 15 minutes or until cheese is completely melted in the middle and the outside is a light golden brown. Let it cool for a few minutes before enjoying!